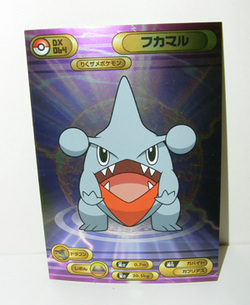 This is the attack version of Gible! Look at him supposedly using tackle but just falling over instead! SO PRECIOUS. This is one of my favouite figures as it doesn't suffer from 'same-pose-itis'. 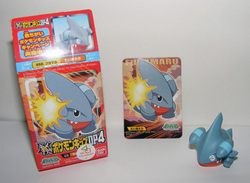 You're the best attack gible ;A; He also comes complete with box and attack kid card! 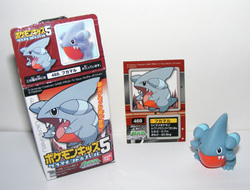 This kid has already become somewhat hard to find due to him not being in stores very long because of B/W hype. 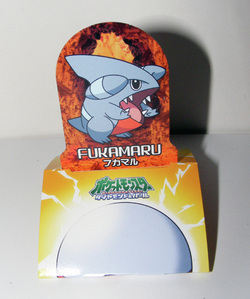 He comes complete with box and stat sticker! I was looking for this lil b****** for about a year, maybe more. HE IS JUST. RARE. That people were starting to believe he didn't exsist because before now there were no pictures, no cases of people owning one (that I'm aware of), the works. He was from one of the very last sets that had clears, and being 1 in 40 boxes? 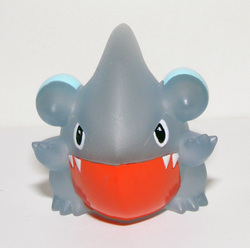 Yeah, rare lil gibgib. 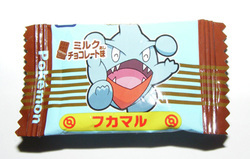 I was just doing my usual search for Gible on Yahoo Japan, not expecting anything. But what's this? A blurry picture of a gible kid a lighter shade than normal? If I had tea in my mouth it would have been spat. Everywhere. And it would have made a mess so IT'S A GOOD THING I DIDNT. So I won it, PAID $25 TOTAL FOR IT, and didn't regret a single cent. 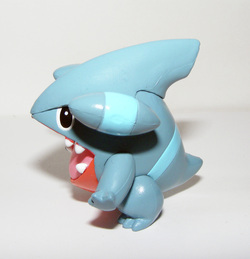 Gible was one of the lucky pokemon to get a Monster collection figure! And boy is it CHUNKY AS ANYTHING. It's huge! 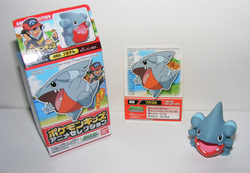 A lot bigger than most tomy figures are. Or maybe it's just me. 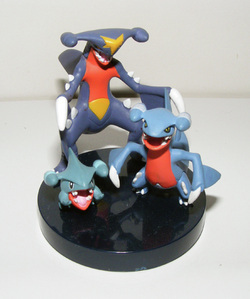 Okay, you guys are looking at the Gible figure I never thought I'd own. THIS GUY. I found out about his exsistance on a blog back in...march I believe? 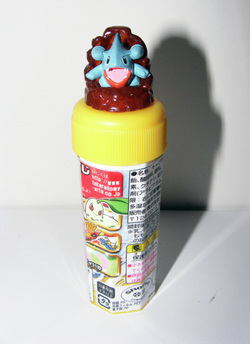 It was a blog that specialises in pokecolle caps, and my god its just. THE CUTEST. 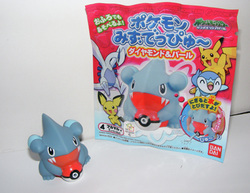 On his lil throne of mud :'D I looked high and low for this lil guy to no avail; Yahoo japan, ebay, amazon, the works. He was just nowhere to be found, even though he was only realeased february of this year. WHY ARE YOU SO RARE. WHY. 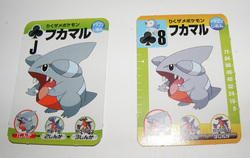 But it seems that the pokecolle cap series always gets very limited runs, and the ratio of Gibles was astonishingly low. 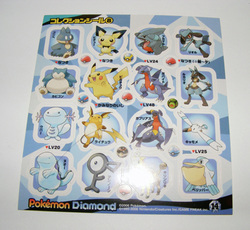 There was 1 gible and 1 chikorita to a box of 8 of these; the rest were Lugia's and Ho-oh's. STUPID TOMY AND THEIR DISTRIBUTION. 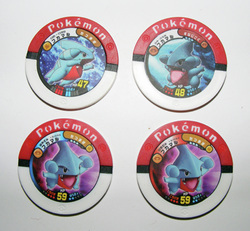 I spent in total around $35-$40 getting this complete set, when it turns out this is looking likely to be the next set released in the UK for a price point of $4. WELP. 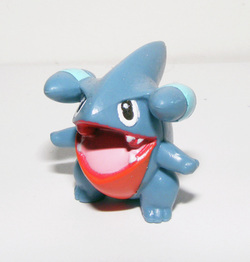 Whenever I get a new Gible figure in, I always say to myself 'this is my most favourite figure of Gible ;A;' and THIS IS NO EXCEPTION TO THE RULE. He's so tiny and cute! And he came with a chupa chup lolly. You can't get much better than that. 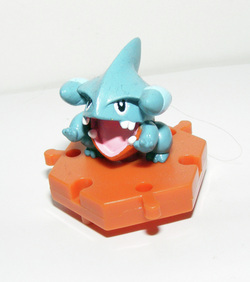 Gible suffering from same-pose-itis on a ORANGE HEXAGON. These guys are TINY. 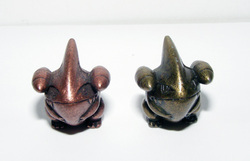 And so awesome :'D They came in a variation of 5 colours; copper, bronze, gun-metal, chrome and gold. Copper and Bronze are the only two I have and I'm looking to complete the set. 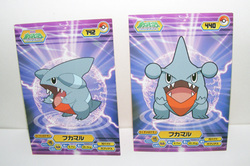 These seem to be stupidly rare however :C I'LL KEEP LOOKING THOUGH. 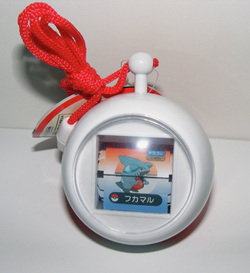 You press a button on the top and it shows a variety of pokemon, BUT WE DONT CARE ABOUT THE OTHERS WE ONLY WANT GIBBUMS WHY YES YES WE DO. 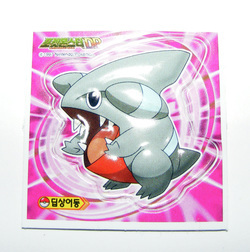 It has gible along with it's name in Japanese kanji. 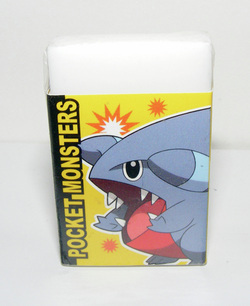 This is a Gible eraser that was only available in Korea. 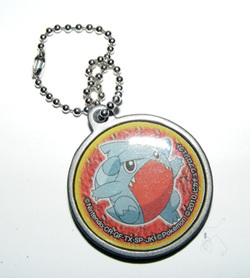 This was on my wants for quite a while, but folvey off pkmn collectors got sales permission just so she could sell me this ;A; THANK YOU SO MUCH. 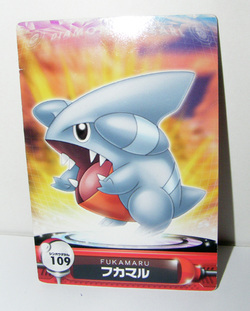 THAT NAME ALONE PUTS COLLECTORS INTO FITS OF TERROR. 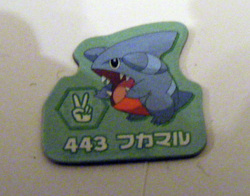 SO I have 3 of the 4 Gible retsuden stampers ever made, and they are CUTE. The red one from movie 13 is my personal fave and is stamped onto all my packages :'D The yellow one unfortunately snapped off the base in the post, but a bit of glue fixed it right up! The pink one was from BrianJapan. I NEED THE FOURTH. LIKE BURINING. I don't care if it's made of card. IT STANDS UP SO ITS NOT A FLAT OKAY? ANYWAY. standee thing. Yes. AWESOME. This was a lucky find in a sales post, as the picture was only of the front and the back of the tracing case. 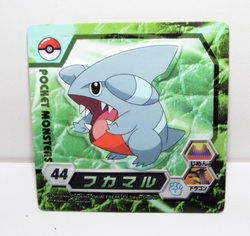 Of course, the back has the tiniest thumbnail of which pokemon are in the set, and me being the crazy Gib lady I am, spotted Gible. SO I BOUGHT IT. 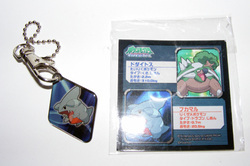 ANOTHER blind packaged charm for movie 13, but this one is A LOT rarer. 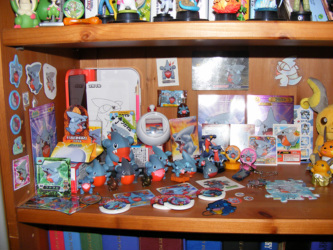 And just amazing ;A; It's so purdy! 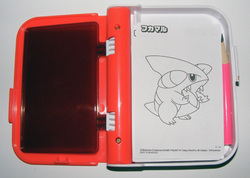 These came in little cardboard slipcases and apparently getting the one you wanted was very hard. It also seemed they weren't available for sale ANYWHERE. 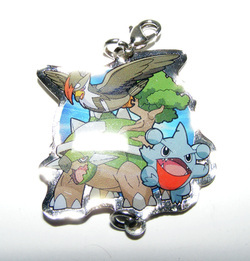 I've only seen 3 charms from this set for sale, and they were all from the same person. When I bought my first bromide I had no idea just how BIG it would be. It's postcard size! 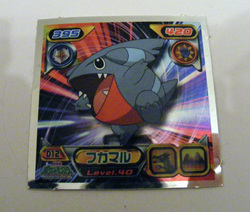 The same as above, but SHINY. 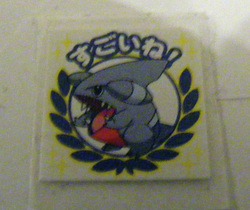 They're armada stickers. But not stickers.